A detailed list of all my favorite things to do and the most important tourist attractions in Kyrgyzstan. 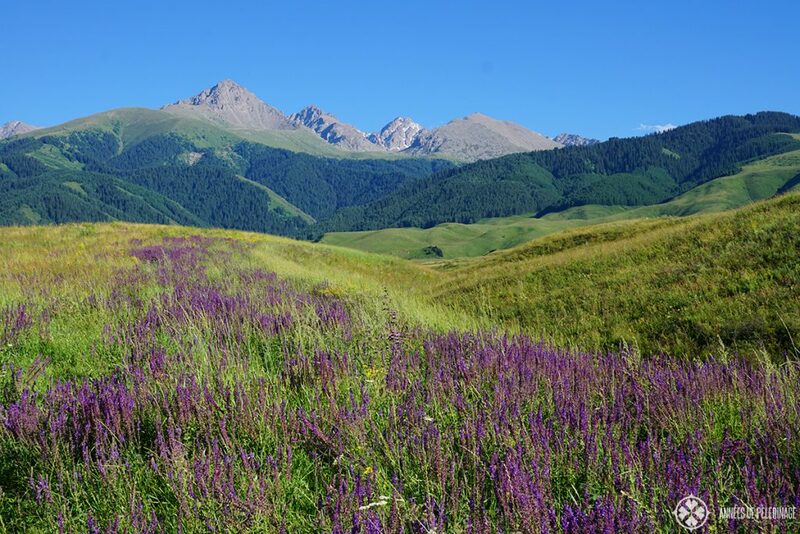 Kyrgyzstan might just be one of the most beautiful spots in the world. 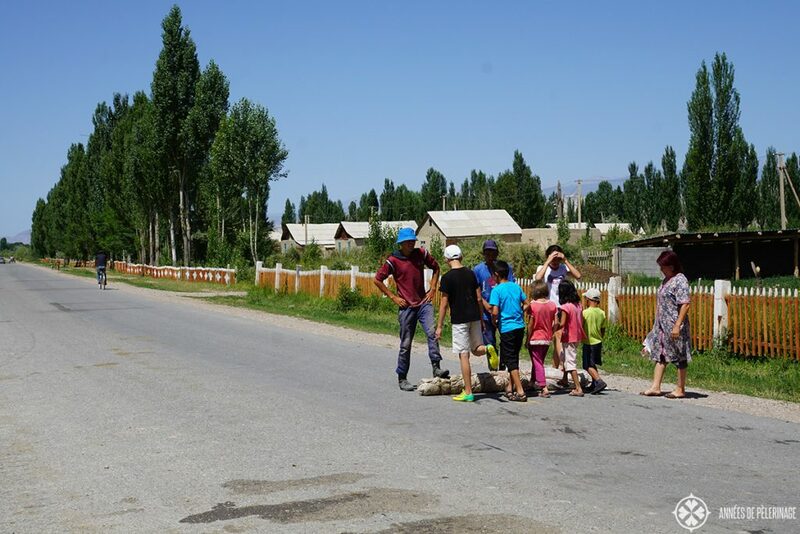 Even though Kyrgyzstan has so many places to visit, the landlocked country in Central Asia sees hardly any tourists (only 1,2 million stays according to official statistics; my hometown, Munich, has ten times that amount). Just why it is so unpopular, I really cannot fathom. Probably a lot of people fear the “-stan”. Pakistan, Afghanistan, and Tajikistan – the whole region isn’t exactly known for its uneventful history. That being said, Kyrgyzstan stands in an utter contrast to many of its neighboring countries. It may not be a very rich country, but its people are extremely hospital, the criminality is very low (except bribery) and the political situation is also totally stable. The only thing the country is lacking (yet) is a good touristic infrastructure. But let that not shy you away. 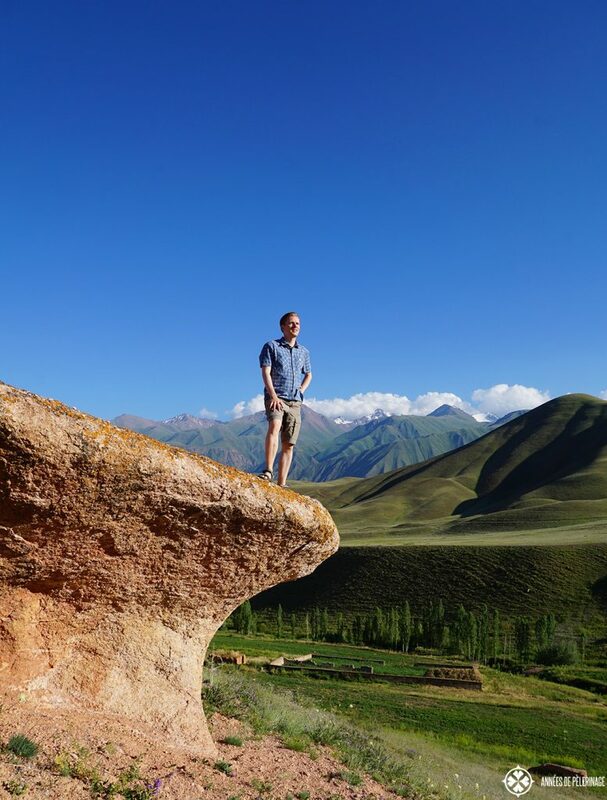 I visited the country (see my itinerary here) and I’ll share my favorite 20 things to do in Kyrgyzstan with you. 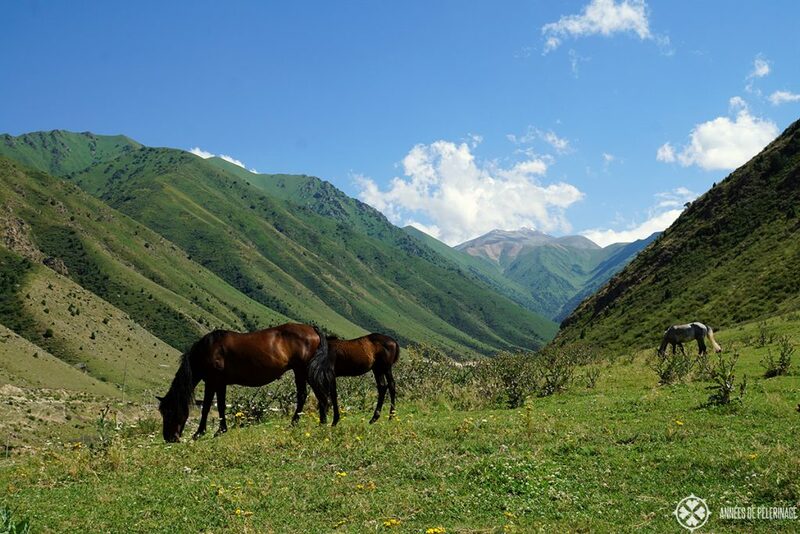 There are not many tourist places in Kyrgyzstan, so be prepared for a wild adventure! 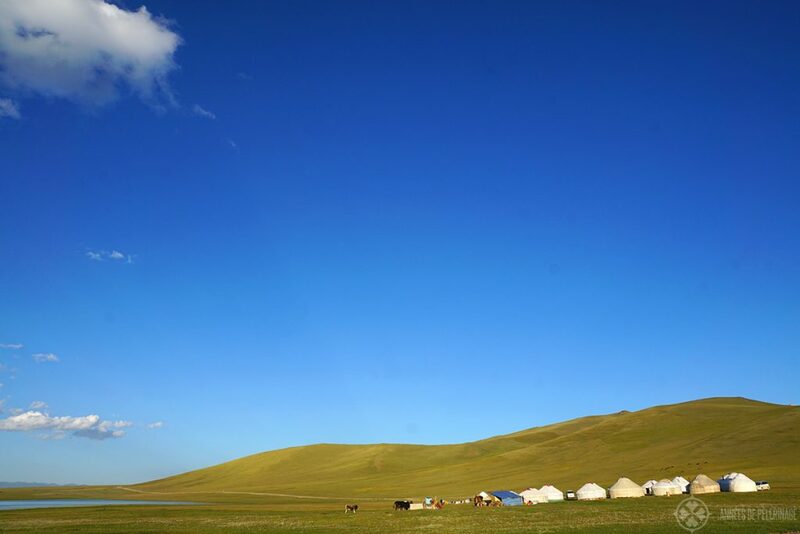 The Kyrgyz people follow a long, long nomadic tradition. I did not find any official statics, but I bet there are twice as many horses in the country as people (and yet again twice as many cows, goats, and sheep). 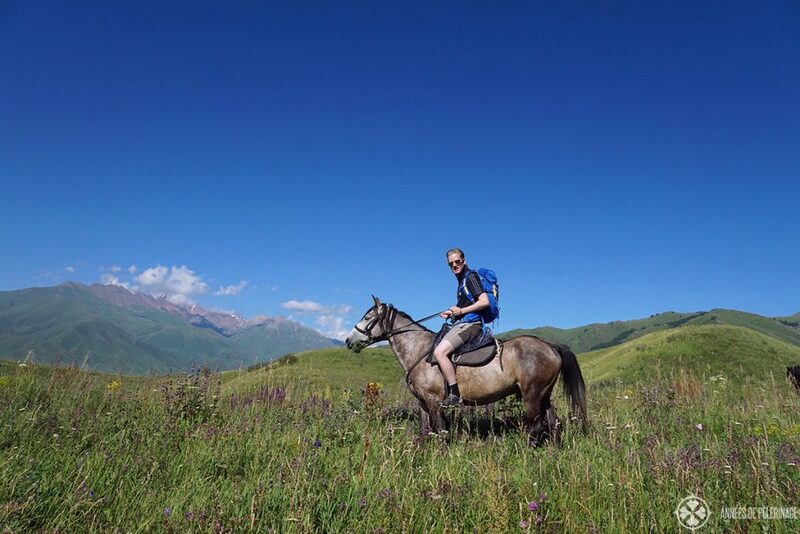 If you have not ridden on one of the beautiful Kyrgyz horses, you have not been in Kyrgyzstan at all. 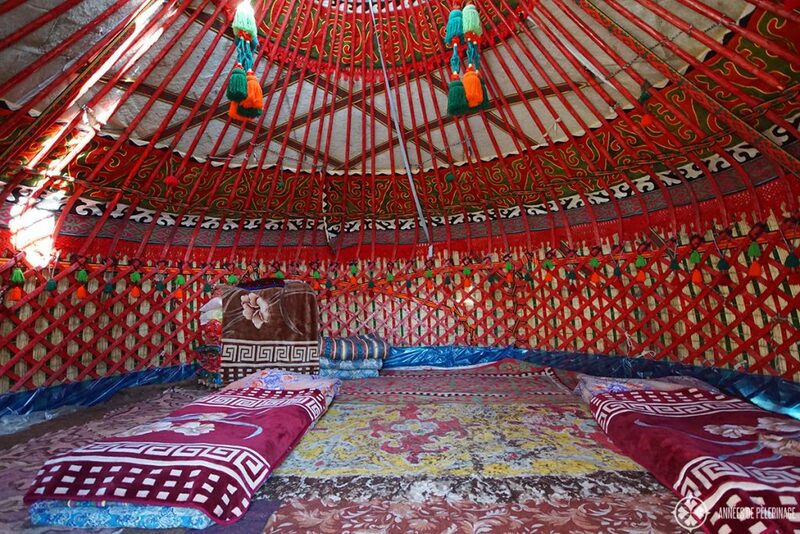 Number two on any list of things to do in Kyrgyzstan should be staying in a traditional (!!) yurt. In summer they pop up like mushrooms all over the country. 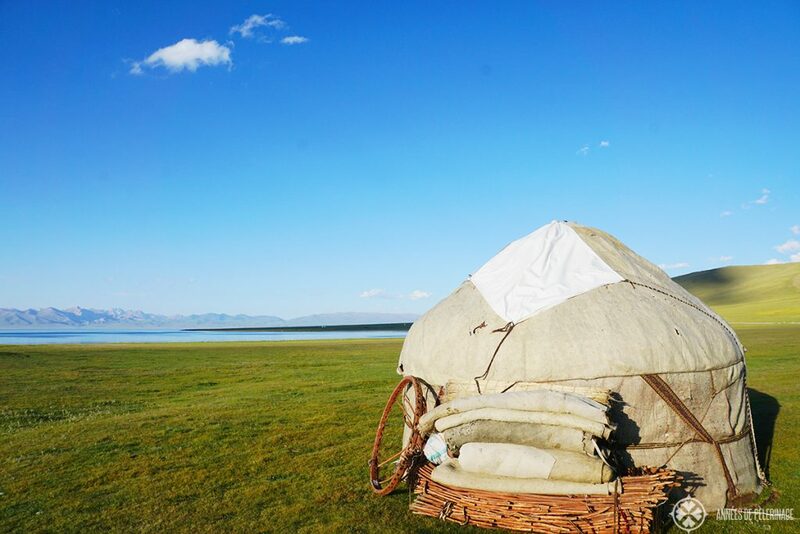 All of them are family run, so you will have the unique experience to get in contact with the nomadic traditions. In recent years, the yurt camps have started to cater to the whims and wishes of western people, so it actually is getting harder to find one, where you still sleep and dine on the ground. Ulak tariysh is the Kyrgyz national game. Much like Polo (which is actually derived from the horse games of central Asia), it is played by two teams of 6 riders each…..and one grizzly beheaded sheep carcass. Almost every village will have a team or two, and matches are held every week. Special matches are held on Independence Day (31. August). 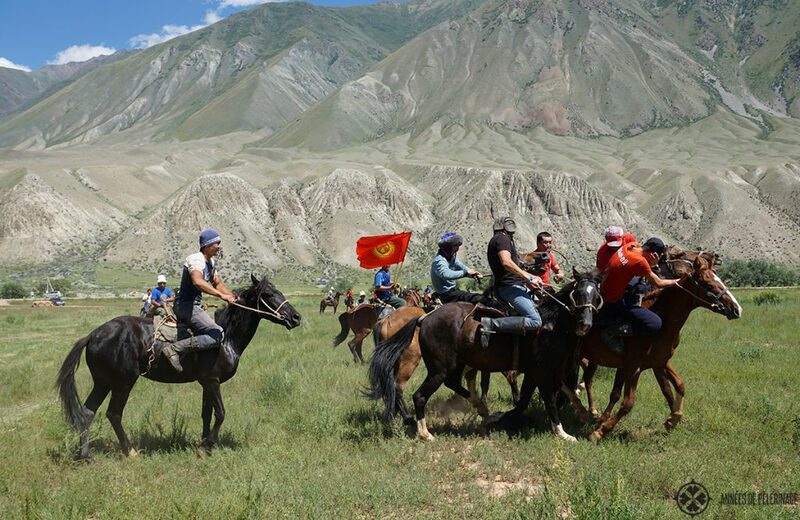 Seeing the unbelievable skill of the Kyrgyz riders in action will be well worth your time. Odarysh is another national game in Kyrgyzstan. It is pretty much like wrestling – only you do it on horseback. Having seen it, I got not the slightest clue how these guys can cling to the saddles the way they do. The goal, you have to know, is throwing your opponent off the horse. Apart from Ulak tariysh and Odarysh there are a couple of other national games. Archery, Falconry, tug of war, and quite a lot of other unique sports that are still practised throughout the nation! 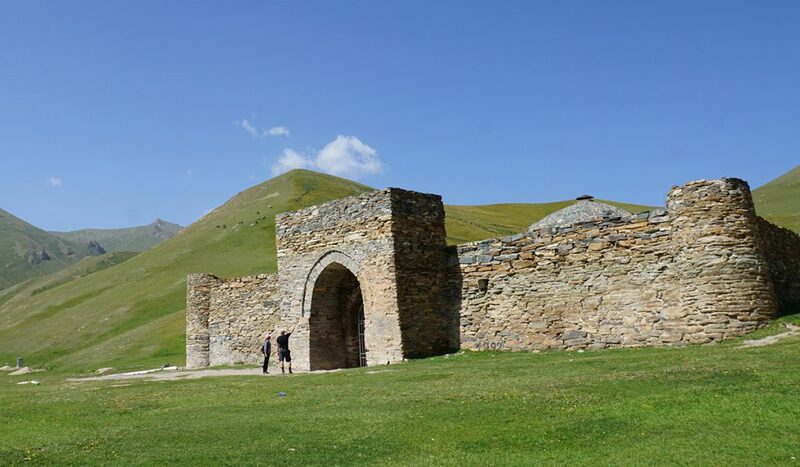 Tash-Rabat is an ancient Silk Road caravanserai that survived the ages almost unscathed. It is located in an utterly beautiful valley in the far south of the country (only a couple of kilometers away from the Chinese boarder). 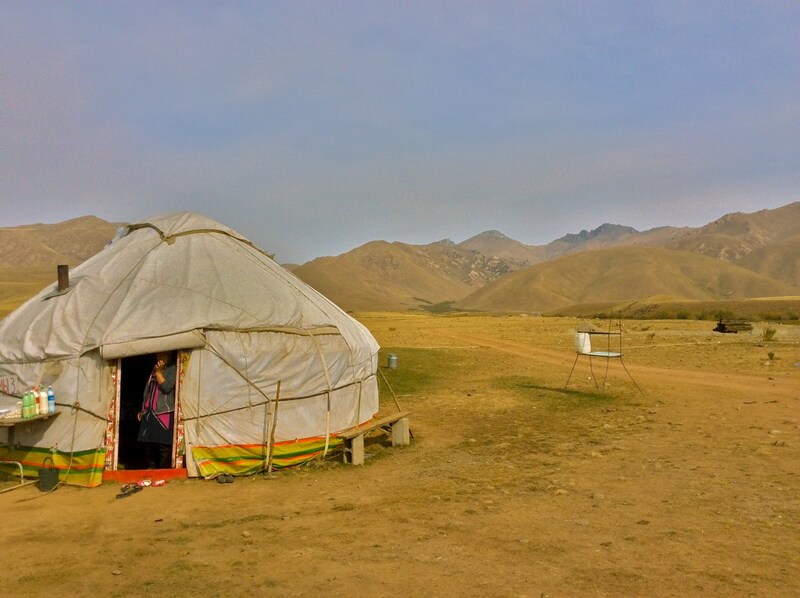 Here you will get a tiny glimpse into the life on the Silk Road you will not be able to get anywhere else in the world. If you want to know more about this spectacular site, make sure to read my article about Tash-Rabat. 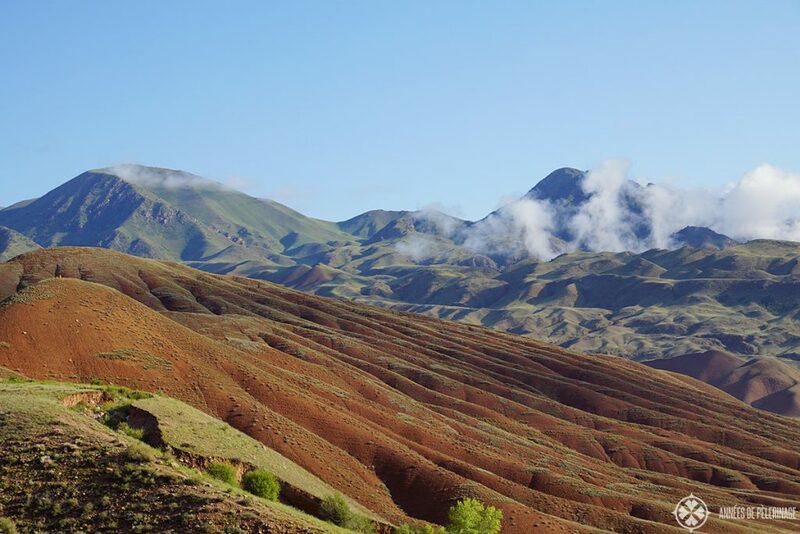 Kyzyl-Oi means ‘Red Valley’, and the name was not given lightly. The small town is located at the bottom of a breath-taking gorge towering over you with red clay. But actually the clay is sometimes browner, and sometimes even yellow. So your vista will constantly be crowded with the most amazing shades and hues, creating an almost surreal feeling. Many interesting rock formations have been created due to rains and winds over the eons. Absolutely grab a local guide to show you around. There are just so many things to do here, that a week would probably be not enough for a passionate hiker. Personally speaking, I’d say that Kyzyl-Oi is, in fact, one of the best tourist attractions in Kyrgyzstan. Son-Kul (sometimes Song Kol or Song Köl) is one of the highest mountain lakes in the world. With a length of 29 kilometers, the amazing lake is located at an altitude of more than 3,000 meters. 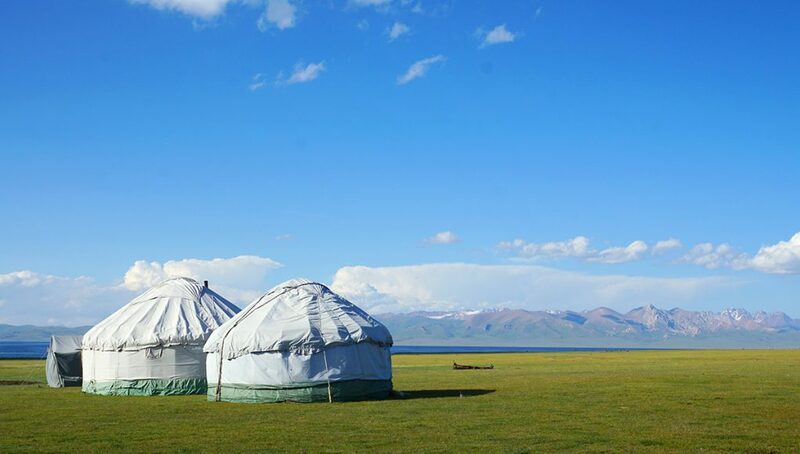 In summer the shore will be sprinkled with yurt camps and grazing animals. It is also known for its rich birdlife, making it a paradise for the ornithologist. The town of Jeti-Ogus or Jeti-Ögus is one you will not forget so fast. 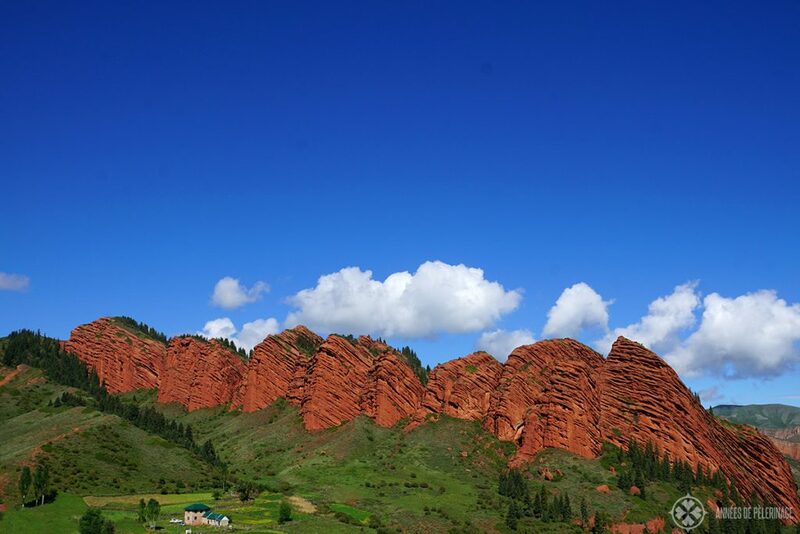 Its name translates to seven bulls because of the more than impressive red rock formation towering above the town. I cannot stress enough how very beautiful it is! 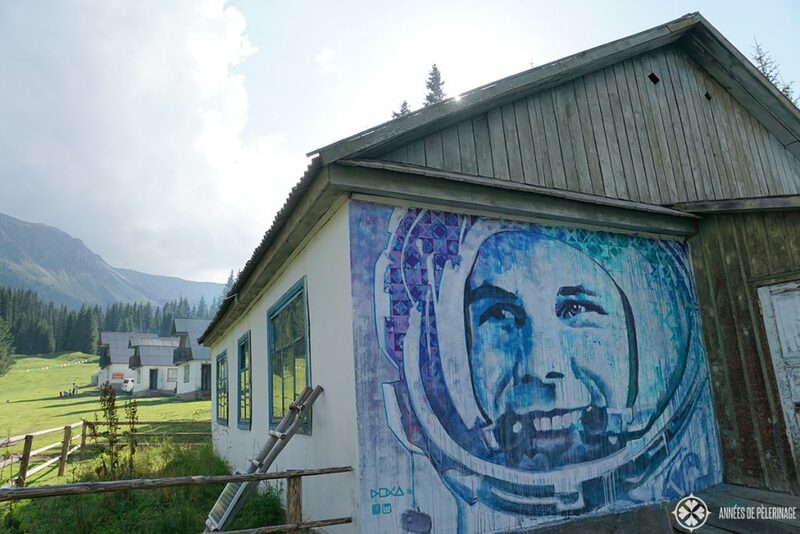 Absolutely put it on your list of things to do in Kyrgyzstan. It might just be the most famous place in Kyrgyzstan. 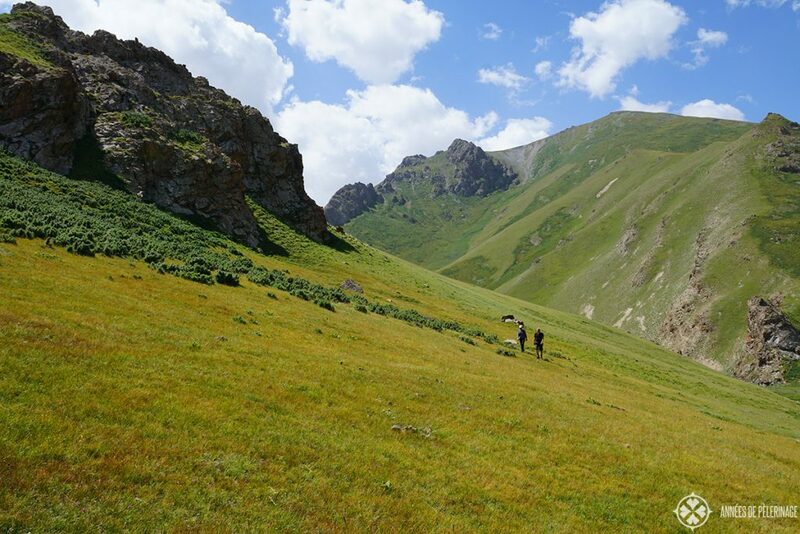 Kyrgyzstan’s nature it almost unspoiled. There are so many uninhabited mountain regions that are possible to see virtually untouched nature. You will have no problem at all spotting an eagle. In fact, they seem to be so common, that you will have to be blind to not see one. Beyond the western shore of Issyk-Kul, you will find a snow leopard rehabilitation center. If you got the time, you should definitely stop by to see the fantastic animals. Tracking them down in the wild, however, might be a tiny tack too difficult. Kyrgyzstan has a lot of half-deserts and smaller desert regions. 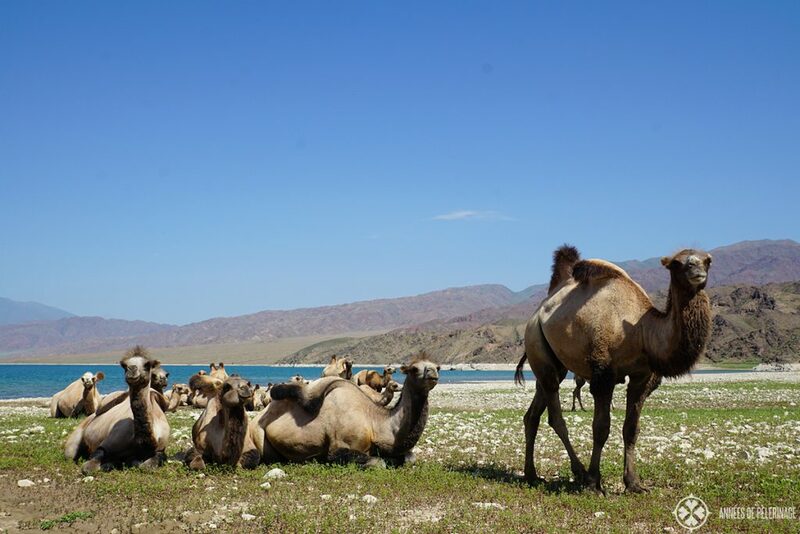 Here you will have the unique possibility to see wild Bactrian camels. It feels utterly unreal to stand amongst a flock of 30 or so. 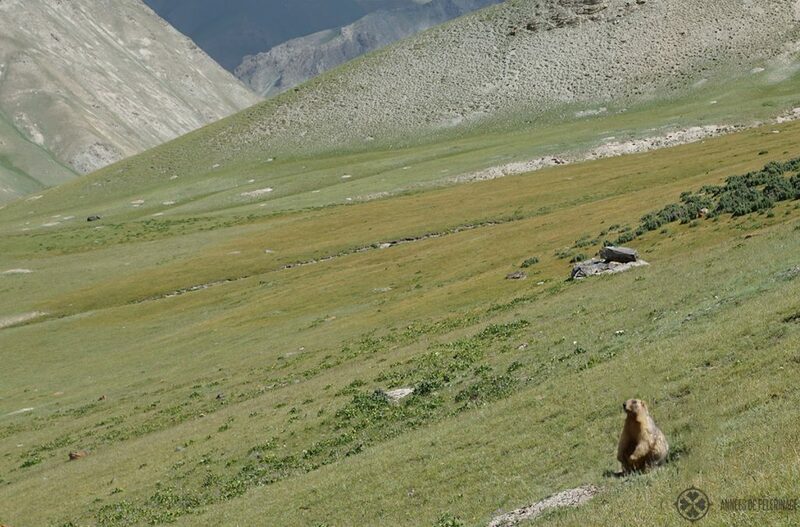 Other than that you will be able to see many birds of prey, maybe deer, maybe Marco Polo sheep and quite possible Marmots. My, how I like these cute little fellows! Oh..and you will see horses….plenty of horses! 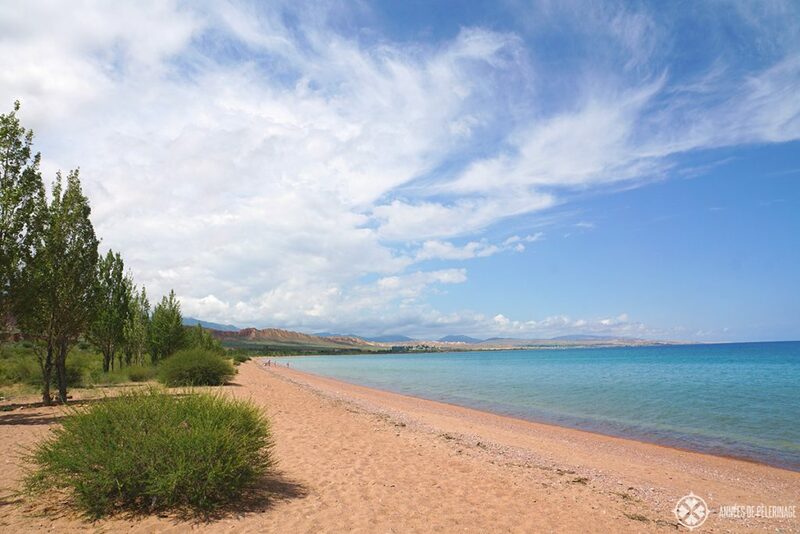 Issyk-Kul is the second largest mountain lake in the world, only rivaled by Lake Titicaca in South America. It may not be as high, but it is just as stunning. It is surrounded by high mountains on all sides, so there are plenty of hiking and horse riding opportunities for you. 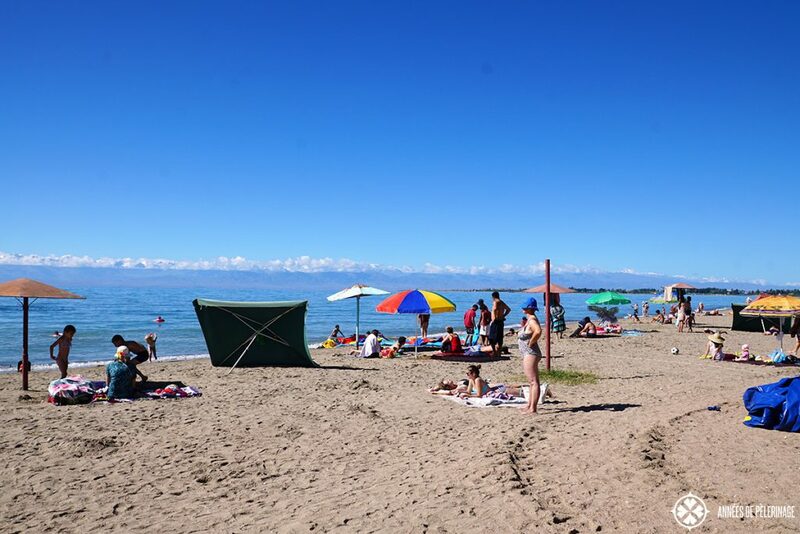 BUT, unlike its cousin in South America, you can go bathing at Issyk-Kul. The water is surprisingly warm and you have the most beautiful beaches. It somewhat looks like in Italy – only without the crowd and mountains some 6,000 meters high in the background. Simply amazing! You have probably heard of the Death Sea, a sea so salty that no fish live in it, so salty that you don’t need to swim to stay buoyant. Well then, Kyrgyzstan has its own version – Tuz Kol, one of the most peculiar points of interest in Kyrgyzstan. 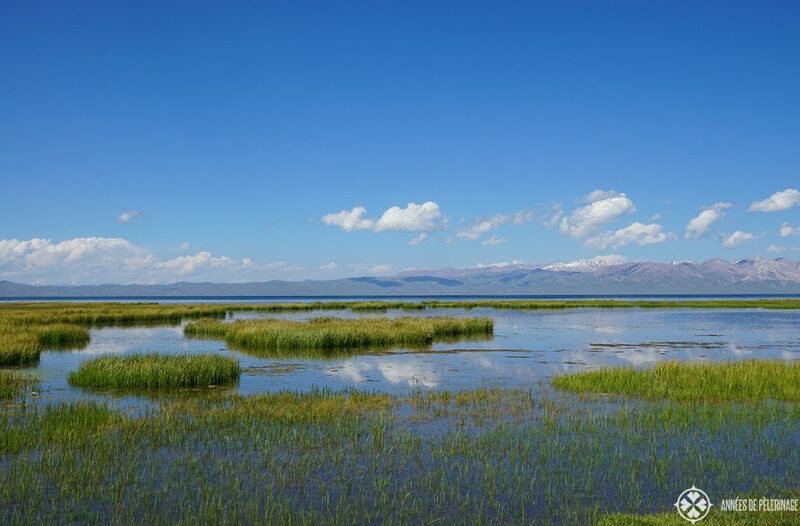 Located close to the Issyk-Kule Lake, Tuz-Kol is almost as salty as the Dead Seas. Especially the salty mud is said to have healing properties and quite a few locals come here to enjoy the warm waters. Eagles are the national bird of Kyrgyzstan. Unlike in many other countries in the world, they are quite abundant in Kyrgyzstan. 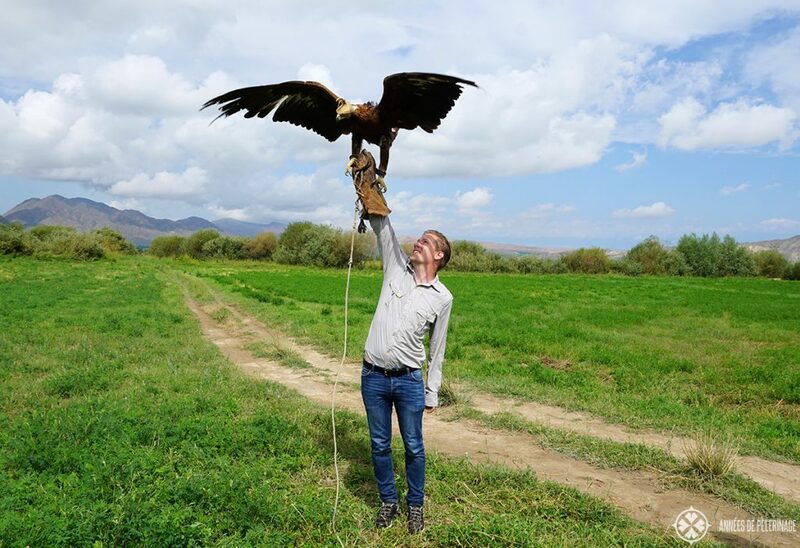 Ever since the dawn of history, the Kyrgyz people used eagles to hunt. Actually, eagle hunting is even a competitive sport in the country. Since there are so many eagle men, you should definitely go visit one! Karakol is the fourth largest city in Kyrgyzstan and quite the teeming city. Like most cities in Kyrgyzstan, it is not very old. 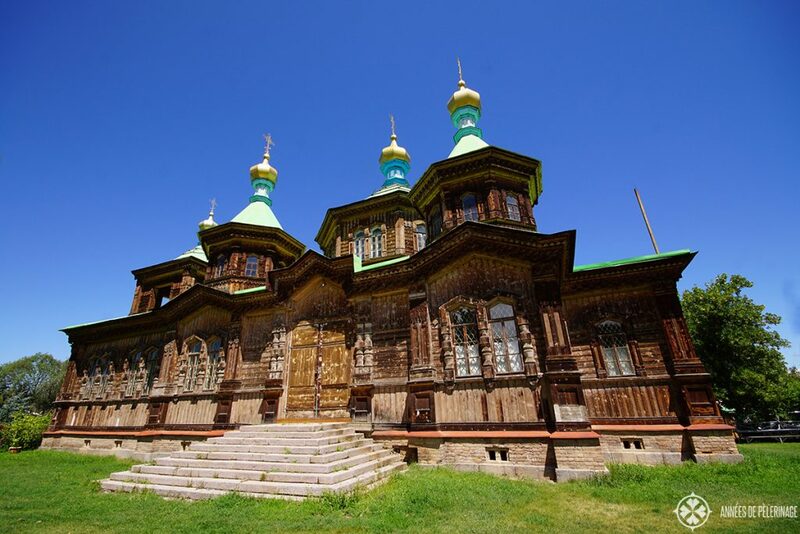 It dates back to 1869 and was founded by the Russian military as an outpost. Even today the city feels very Russian. Definitely, drop by to visit the orthodox church. Your main highlight, however, should be the animal market. 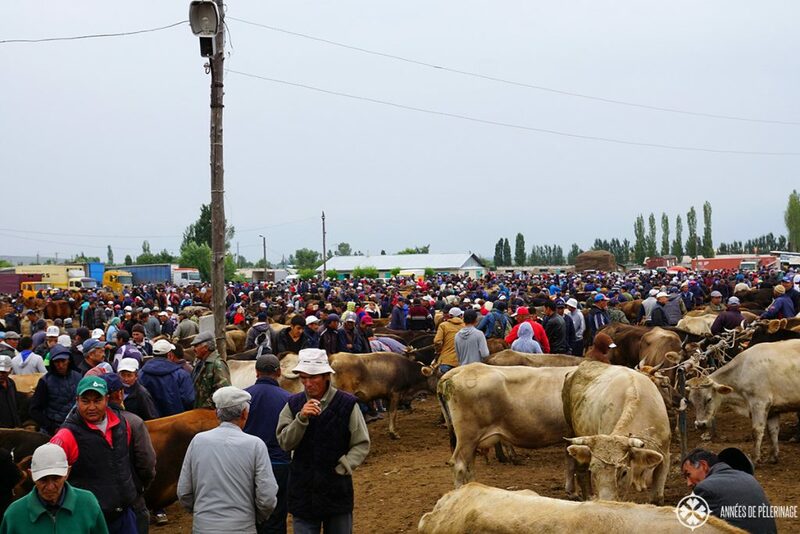 Every Sunday half the country seems to converge on the bazaar to sell their livestock. Horses, goat, sheep, and cows are being offered to those willing to buy them for their meat or breeding capabilities. 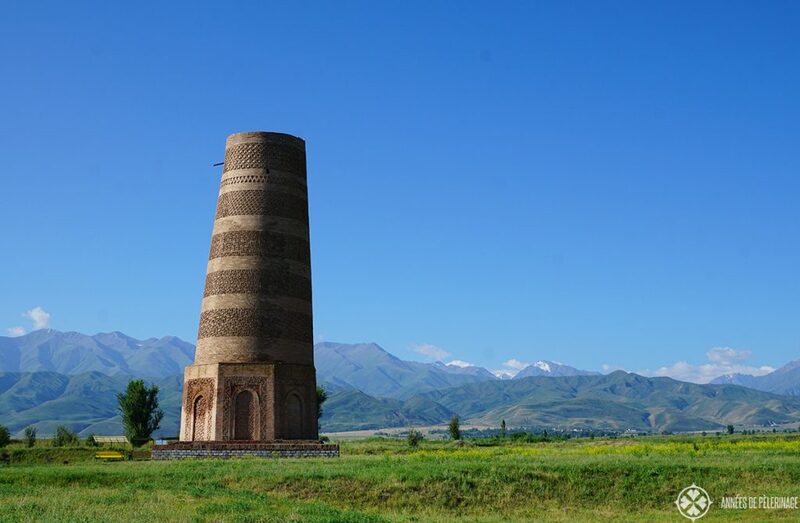 The Burana tower is the remains of an ancient minaret dating back to the 9th century. It is all that remains of a huge city the so-called Karakhandis established on the fertile plains. It is one of the very few architectonic highlights of the country. This item on my list of things to do in Kyrgyzstan is kind of trivial: with so many mountains in the country, there is no way around hiking. Much as I loved riding over the rolling hills, hiking connects you way deeper with the landscape. And my, what a landscape it is. I have honestly never seen more beautiful mountains than in Kyrgyzstan. People always ask about famous places in Kyrgyzstan, but I am not sure if that is actually the right question. The country as a whole is just so beautiful that you can basically go hiking everywhere and see spectacular things. Get a local guide so he can show you the points of interest if needed. 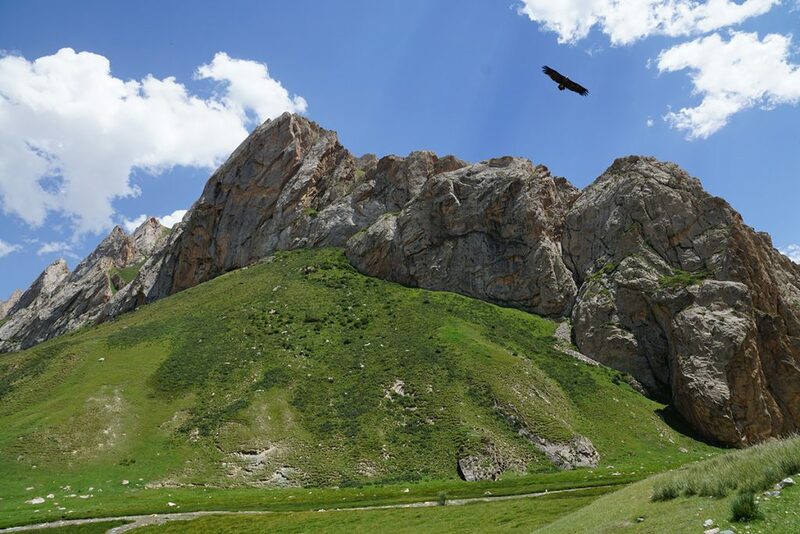 Talas is an enchanting region in the northwestern part of Kyrgyzstan. It’s not far from Bishkek, and the border to Kazakhstan is also quite close. Here’s a blog about Talas Kyrgyzstan you will enjoy. 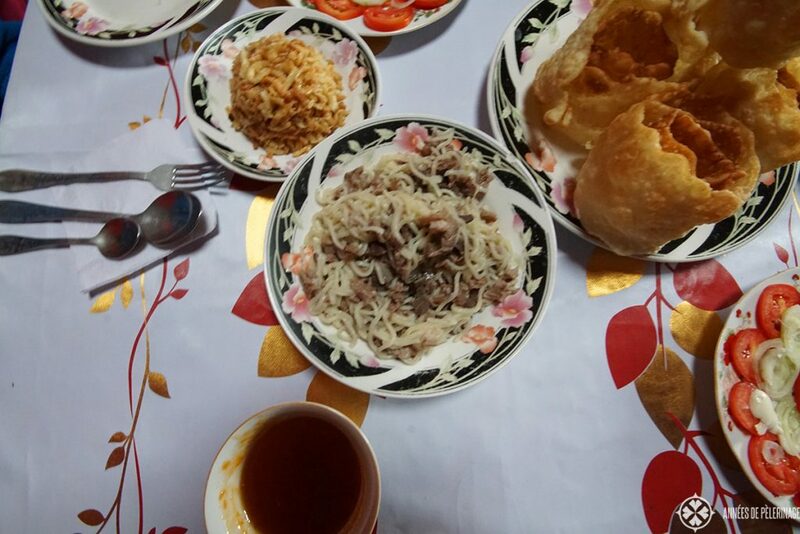 Beshbarmak is Kyrgyzstan’s national food. Translated as “Five Fingers”, it is basically horse meat with noodles (though you will find it with any other kind of meat as well!). A true Beshbarmak banquet will feature a table almost bursting from other food stuff. Definitely, eat it in a yurt for the most authentic experience. Only a couple of kilometers away from Bishkek you will find a beautiful mountain gorge called Alamedin. Many locals come here because of the (rather ancient) Russian spa, where you can soak away in healing Radon water. As a western tourist, you should probably concentrate on the beauty of the valley, as the spa is in a decrepit condition. 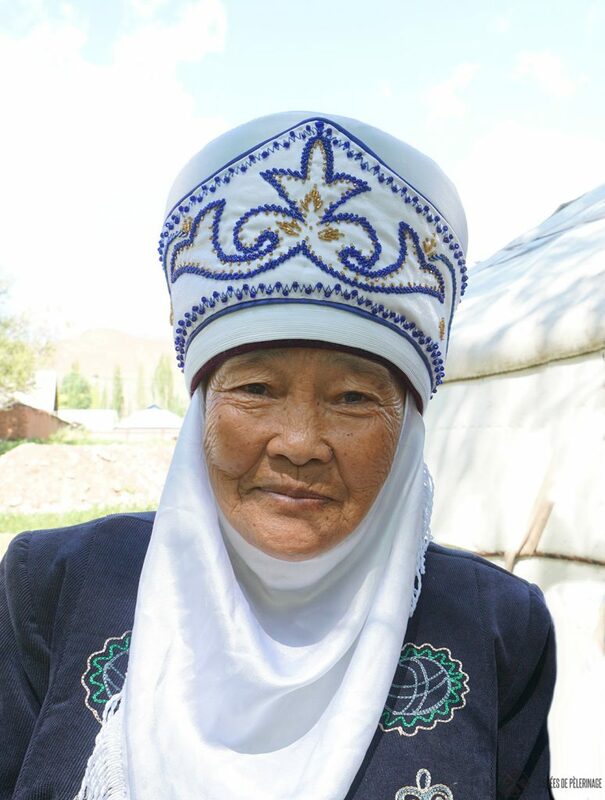 Last, but certainly not least, you really should get in contact with the Kyrgyz people. They are a mountain people and somewhat reserved. So don’t expect them to greet you with wide open arms and a “hi, how are you, where have you been, come in, have a cup of tea, where are you from”. But if you take your time, if you are truly interested, you will be able to explore a true treasure trove of stories and experiences. 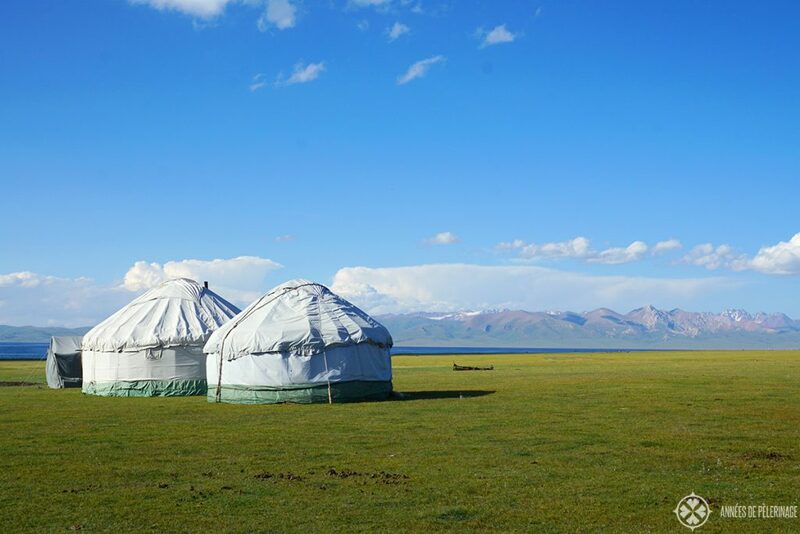 You will also get to experience the fabled Kyrgyz hospitality – so definitely give it a try! 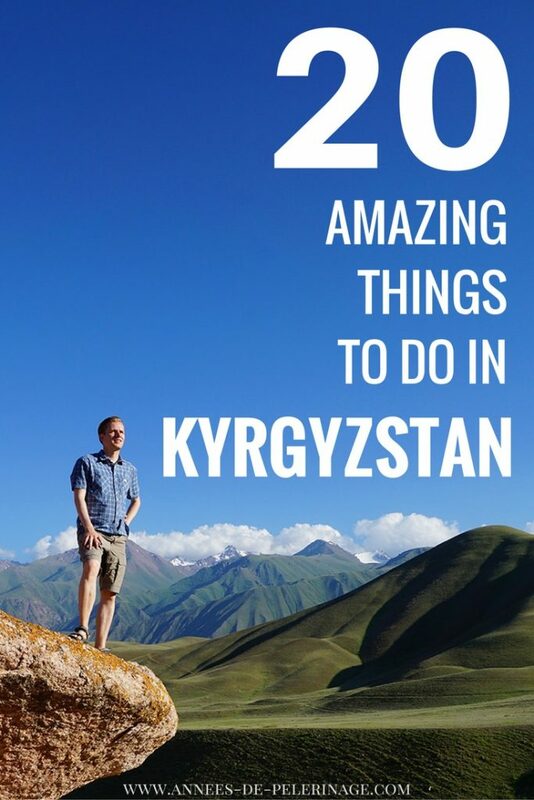 Regular readers will already know that I really like the numbers 20: 20 things to do in Cusco, 20 things to in Paris, and now 20 things to do in Kyrgyzstan. In reality, there are obviously so much more places to explore and things to see in a country as diverse and beautiful as Kyrgyzstan. Most people, however, will only have a limited amount of time, so endless list serves nobody. So, given enough time, you could possibly go exploring the Soviet past. The southern shore of the Issyk-Kul lake is home to the most fantastic rock formations AND some of the highest mountains on this planet. You don’t need to be afraid to run into tourist traps because frankly there are no other tourists to speak off. Security is, by and large, no issue. At least I did not encounter any. Human Rights Watch is a bit more critical about Kyrgyzstan, but I guess those concerns will not affect you as a tourist. Kyrgyzstan is largely unchartered territory. If you see something awe-inspiring (which happens virtually 10 times a day) stop the car, get out and enjoy it. Take a hike if necessary – I doubt you will regret it. Definitely bring along a map (don’t count on your internet connection) and have a guide book along. I can utterly recommend the Bradt Travel Guide to Kyrgyzstan. In fact, I have been chatting with one of the authors before my trip, so do give it a try. Still, it is certainly not the only fish in the pond, so here are some more recommendations I found very helpful. Usually, I like to close my articles with recommendations for accommodations. From personal experience, I know how utterly hard it is to find honest, non-sponsored opinions on the well, so I feel the need to share mine. For Kyrgyzstan, I am having a very hard, hard time. Mainly because I have no found a single hotel, guesthouse or yurt camp I could really recommend. They were, with one exception, all abysmal. No electricity, no running water, no warm water, no toilet, shared bathroom and stale food were the common characteristic of most of them. Personally, I did not mind so much because I was here for the stunning nature. Many people I know, however, would mind. So taking your own camping gear might actually be a good idea to be on the safe side. So that’s it. That has been my list of 20 things to do in Kyrgyzstan. Hope you found the information helpful. If there’s anything you’d like to add to my list, or if there are any questions, just let me know in comments below. Disclaimer: This article contains affiliate links to products I have previously bought. If you buy via my links, you got the chance to support my work at no further costs to you. Naturally, you are free to buy these products via any other vendor as well. One of the countries on my list. Thanks for the tips! 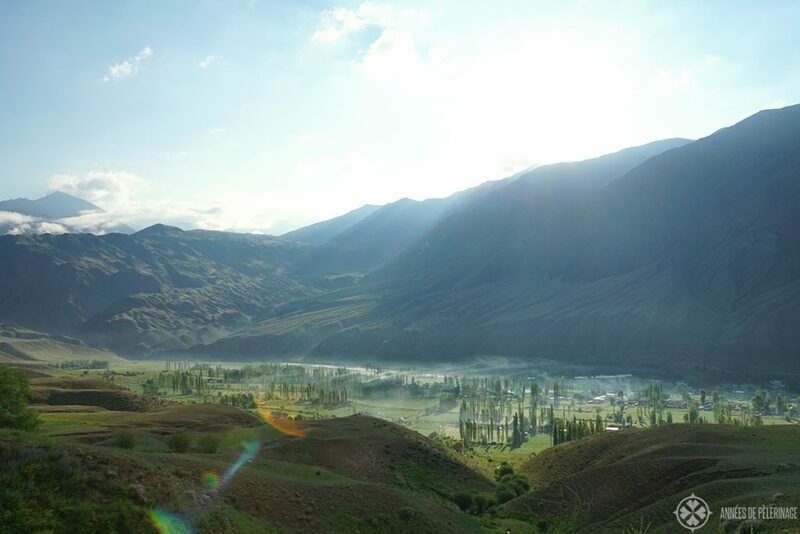 I want to go to Kyrgyzstan so bad and these pictures make me want to go even more! you really should go. Kyrgyzstan is just beyond lovely. A country where it is impossible to hold your camera still. Just remember to go in summer, as it can be extremely cold in winter! I’m also from those people who would love to visit Kyrgyzstan. And not only Kyrgyzstan but all of those countries ending with ”stan”. All of those things in that list are awesome. The yurts are actually looking very nice. Well, it’s not a luxury hotel with a pool, but I believe the experience is far more amazing. A different country that people not normally talk about, but your article makes me want to visit. Thanks for sharing! If you check any reliable global internet travel sites such as tripadvisor or booking.com you can clearly see which hotels have top guest ratings. You can absolutely be sure that those ratings are coming from all people from around the world. Hyatt’s guest rating in booking.com is 8.3 (very good). 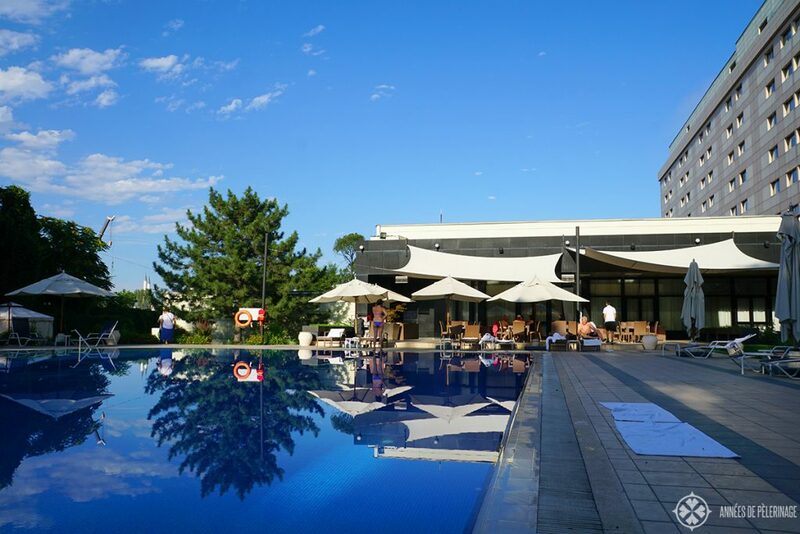 But there are other western standard hotels that have higher ratings than Hyatt like Golden Tulip (8.5), Smart Hotel Bishkek 8.8 (Faboulous), Damas International Hotel (9.0 Superb), Solutel Hotel (9.6 Exceptional). These are the ones I would recommend. thank you for your input. First of all, I know that many people rely on tripavisor ratings. But these people obviously wouldn’t read my blog in the first place (cuz they ended up on tripadvisor). All the hotels you recommended may be decent, but none of them has a pool worth its name or a good restaurant. Also, the good rating of Soulhotel is based on 96 reviews. It is also, despite only average service, interior design, location and, placed at the top on most booking sites. Which means the good rating is probably bought with a very high share for the booking sites & low prices to warrant such a good position. This industry is rigged to the core. Unlike what you may think, ratings on most “internet travel sites” are anything but reliable – especially if you are looking for true luxury. It’s quite common that agents from booking sites will call a hotel, promising them a better placement in the search, if they will offer a discount, lower they rates or simply pay money. Hi, thanks for sharing love the pictures and details! Just wondering what you thought about the culture there, the people, how they made you feel? You could perfectly rent a car for Kyrgyzstan and drive around yourself – as long as you got a map & know where u are staying. But the road system is not all that complicated. You should be a good driver though, as some roads are a bit challenging. As the border between Uzbekistan and Kyrgyzstan is frequently blocked (they really don’t like each other all that much), I do recommend taking a flight. Renting a car and driving around Uzbekistan is not a possibility – or well it is, but it will be quite a bureaucratic nightmare to get that approved by the government. Thank you for the article but as you said that theirs a lot of places in Kyrgyzstan worth visiting can u send me the information? I’m going to study medical their for 5 years so yeah.. I’ve a lot of time to enjoy the beauty of this country. I’m from India and I’ll be studying in Kagma University Bishkek.